Set on 5 acres close to beaches, attractions and the heart of Surfers Paradise, Paradise Resort Gold Coast is renowned as heaven for kids and paradise for parents. We offer a range of comfortable holiday accommodation options ideal for families & sleeping up to 8. Choose from standard Resort rooms, Resort family rooms with a second bedroom, Resort interconnecting rooms or our famous Junior and King bunkhouses. The only Gold Coast resort that truly caters for babies and toddlers right through to 12 year olds, you can relax knowing your kids are having a ball. The Zone 4 Kids Club offers fully supervised sessions in a range of magical themed play spaces. 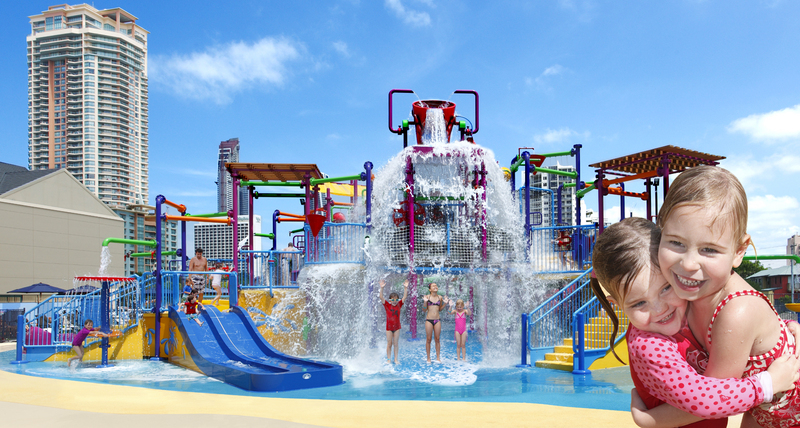 Outside, your kids can burn off energy in the giant Zone 4 Kids Water Park, located in the centre of the resort. In addition to the waterpark, kids club and daily activities already on offer, guests can now add ice-skating to the itinerary. Planet Chill is a permanent ice-skating rink located at the resort, offering holiday fun for all the family, all year round. And while the kids are being looked after, parents can re-discover the art of relaxation in the exclusive Zone 4 Adults. The outdoor spa area features a large heated spa and lounge chairs, offering parents a 'child free' place to unwind and soak up the sunshine. Complete with the lagoon pool and spa, outdoor playground, bistro, cafe and bar, plus a host of free daily activities, Paradise Resort is the perfect choice for your next family holiday. Having heard so much about Paradise Resort - one of the most popular destinations for Gold Coast holidays with kids - I had to see it myself. What hits you after you get your bearings is that everything is on-site - accommodation, food and heaps of activities. Sort of like a land-based cruise ship, without the ship bit! Paradise Resort is constantly evolving, but everything they do is developed with families firmly in mind. We only stayed one night, so opted for the Resort Room (the most basic option on offer), which had a Queen bed, single bed and smaller fold-out bed. Larger, more elaborate rooms featuring bunk bed enclaves are also available, as are family rooms and interconnecting rooms for larger families. Little extras, such as a step stool in the bathroom, were great and not something I've seen elsewhere, and I was pleasantly surprised to find a nice brand of instant coffee sachets in the room. But Paradise Resort is not about being in your room. From early morning, families start to gather in the central outdoor area, with the pool and large spa. But it is the waterpark that takes pride of place and where some of the biggest smiles and squeals come from. There are actually two waterparks - one for older kids and a junior waterpark. The popular kids club (a two hour session was included in our overnight stay), is also divided into under 2s and 3-12 year olds. Additional sessions can be purchased. Other fee-based activities include rock climbing, laser tag and ice-skating at Planet Chill (yes, this Gold Coast resort has an ice-rink). In addition to these, a weekly activities sheet in our room gave us a great overview of what was on offer, including hair braiding, treasure hunts, crafts, dancing, trivia, duck races and an outdoor movie (some activities are free, others have a small charge). There is also an indoor jungle gym, a playground and sandpit. In fact there is so much on offer, it's probably easiest just to read more via Paradise Resort's website. 1. Although Paradise Resort is constantly looking at ways to keep older children engaged, my son, Mr 12, felt he was bit too old for the scene. There is no doubt most families we saw had younger children. 2. Paradise Resort is not the place for a quiet holiday – but if your children are after action, fun and making new friends, this is the perfect place for your family. Note: Our accommodation was independently booked and paid for. Views are my own. Stayed With: two adults & 3 children aged 9, 6 & 3. It is marketed as entertaining the kids so Mum and Dad can relax - and relax we did. The kids really enjoyed the water playgrounds, of which there is one for the bigger kids and a smaller one for the younger children. There is only one swimming pool for the whole resort - maybe a little bit small for the number of people - but we didn't spend much time swimming as the kids enjoyed the water playground so much. The room, including the bathrooms, could do with a make-over and personally, I dislike showers in baths with shower curtains. I understand renovations are planned early next year. There was a small fridge, microwave, kettle and toaster and limited bench space - enough to make breakfast and lunch. We had one evening meal at the poolside cafe. The food was basic, but if you want more options, you can walk to the main strip and enjoy a meal in one of the restruarants there. While we did not use all the facilities on offer - and there are a lot - we had a great time. The kids were happy and had lots of fun. Kids comments: Awesome water playground - Ethan, aged 6.